If you're reading this, you most likely failed state inspection for "faulty hi-beam switch". Or if you haven't been failed yet, at least you have to tilt your steering wheel all the way down to switch the hi-beams. Many dealerships and shops will tell you that you need a new switch and will charge you anywhere from $300 upwards. Or at least they will try to convince you that you need a new transmission. Well, the dealership it lying to you, as usual. The truth is, your hi/lo beam switch is merely out of adjustment. 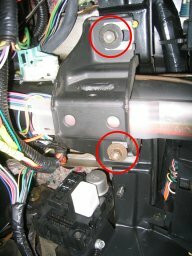 The way it works is that when you pull on the the multifunction (blinker) switch on your steering column, it pushes a rod that follows the steering column down under the dash and it, in turn, pushes the hi/lo beam switch that's mounted on top of the steering column, deep under the dash. If you are an experienced home mechanic, it takes less than 1/2 hour to do. If you've done it more than 5 times, you can adjust it in under 10 minutes. Drop the knee pad, drop the column, move the switch rearwards, bolt it all back up! First, you need to remove the knee pad under the dash (the driver side, of course). Then look at the steering column. It is held in place by two 15mm nuts. There might be an extra bracket on the studs, attached with another pair of 15mm nuts. So take a deep socket and remove these nuts (and bracket if needed) and the column will drop some. It should hang there, held in place by wires and such. 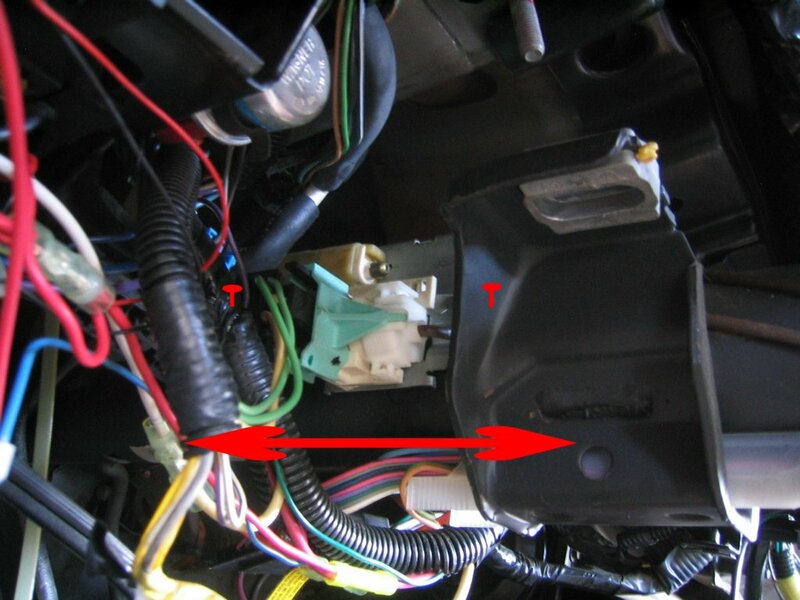 Before you pull it down more, make sure nothing will break under the dash, especially switches protruding from the pedal assembly. Now you can already see the hi/lo beam switch. It's mounted on top left of the column. It's usually white. Now you will need a 7mm or 8mm (can't remember) wrench/socket. There are two screws that hold the switch in place and are located on the front and rear of the switch (from the driver's point of view). They are not visible in the picture but I denoted their position. After you loosen the screws 1/2 a turn to 1 full turn, you can move the switch fwd and back (as the arrows indicate). If you move it back (towards the steering wheel), you will be taking up the slack in the mechanism. If you move it fwd (towards the engine), you will be adding play. If your hi/lo beams are hard to switch (or only with the steering wheel tilted all the way down), the switch needs to be moved rearwards a bit to take up the slack. Tighten one of the screws and try to switch the hi/lo beams. Re-adjust if necessary. Tighten both screws. Raise the steering wheel, reconnect all wires you might have disconnected, put the 15mm nuts back in place and tighten well. Replace the knee pad and you're DONE! If you have any questions about the fx or feedback on this article, feel free to contact me.